Please treat your personalised candle with special care, in particular any three-dimensional embellishments and lettering. Ensure candles and matches are kept well out of reach of children, and also consider your pets sleeping or moving near an open flame. Always place your candles on a stable, heat-resistant surface. Ensure lit candles are kept out of droughts and away from air conditioning and fans to prevent large flames and a shortened burning time. Exposure to direct sunlight may cause the colours to fade. We recommend you snuff out candles, taking care not to damage the wick. Keep the wick trimmed to around 10mm and the wax pool free of any debris. 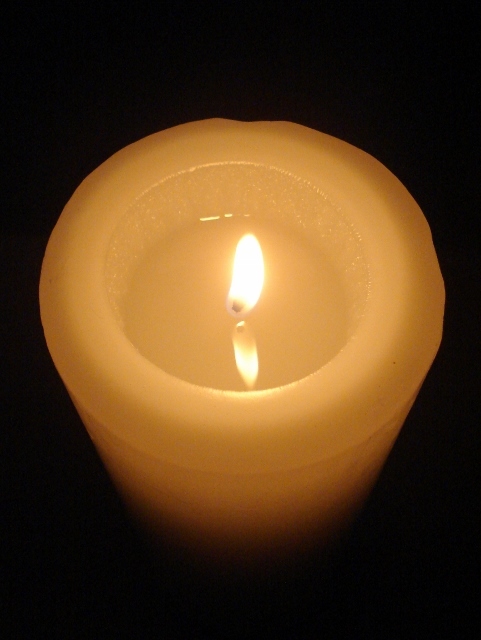 Do not burn a candle completely but dispose of it when it is within 20mm of its base or holder. During ceremonies, your candle may only be lit for a short time. However, if you are planning to use the candle on a regular basis, it is recommended that when first lighting or after the initial ceremonial lighting of your candle, you let it burn long enough to create a pool of wax across most of the diameter of the candle. 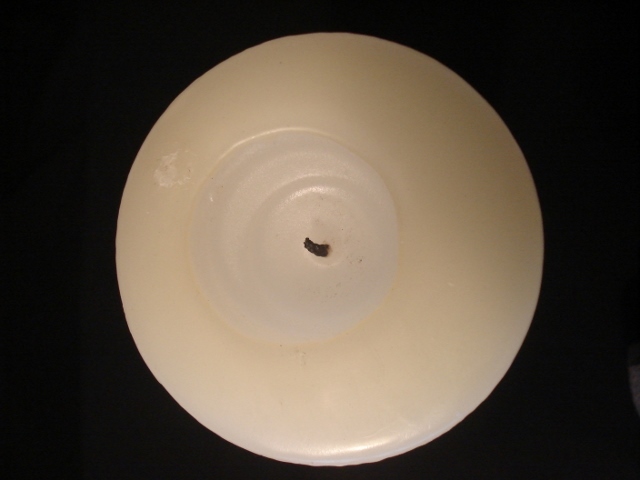 For a 95mm diameter candle this may take up to 10 hours, at which point a wax dish of approx 15mm depth has formed, with a rim of wax of 15mm. When re-lit, the candle will always melt back to this full diameter first, which makes the process far more economical. This avoids 'channelling' as seen here on the right. Our wax bowls, cubes and vessels are lit with replaceable inner candles which are positioned in the centre of the container. When lighting these, it is recommended to place a small amount of water or sand or salt underneath to avoid the flame damaging the base of the outer. We supply a sachet of beautiful Coromandel sand with each bowl and cube. Note: Our new candlemaker creates the bowls with a glass tealight holder integrated in the candle. These are wax vessels half filled with wax. When lighting lanterns, a relatively even cavity of about 60mm diameter will result. You may wish to insert a votive candle at any stage to extend the lantern’s use. It's important to extinguish the flame of the lantern before it burns too low, as the wick continues right through to the base. Always place your lantern on a candle plate. It is recommended to store candles in a dark environment, best in the gift boxes provided, and in a horizontal position to avoid bending, at normal room temperature. Place 3-dimensional decorations facing upwards. Our candles are delivered wrapped in white acid-free tissue paper, please re-use this material. Scrunched up, over time tissue paper will leave a pattern on the candle and the decorations. Avoid direct contact with plastic bubble wrap as the circle patterns may imprint onto the candle. Over time, hand-poured white candles will naturally darken slightly, and the burning properties of a quality candle improves. 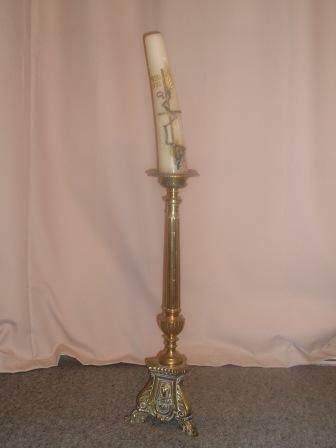 This beautiful wedding anniversary candle was displayed for many years and over time curved, a condition which will take many weeks or even months to rectify. Please ensure that your candles are kept away from direct sunlight as this causes colour fading. This 'entertaining' candle set was displayed on a sunny window sill for just a short time. Let spilt wax solidify so when it hardens it can be removed in pieces. Any residue on fabric can be removed by overlaying the stain with a paper towel and gently pressing it with a warm iron to create a blotting effect. We trust you get much enjoyment from your special candles.